Well we did it! We reached 120 bird species seen in Bryant Park! They haven't all been seen on the twice-weekly walks that I lead: that's the total number of species of birds recorded by all observers over the years on the website eBird.org, where many birders and citizen scientists record their sightings. I have personally seen 66 species of birds in Bryant Park, as of this week. Numbers aren't everything of course: there is so much more to learn about bird migration and urban survival, the numbers don't tell half the story. Still, the latest addition to the avifauna of the park was particularly exciting and surprising, as it is an uncommon species, and unexpected in a place like Bryant Park. It was also the first time the species had been seen not only in Bryant Park, but in all of Manhattan! It had been heard singing once in Inwood Park, but never actually spotted before. Nelson's sparrow is the 120th species spotted in the park. What was this mysterious bird? A little skulking brown ball of feathers called a Nelson's Sparrow. They are so shy and good at hiding, they might be more frequent visitors to Manhattan than we realize. Normally they are found in tidal salt marshes, scuttling through the cordgrass like mice, or popping up on a grass-stem to sing their insect-like song. They have a limited breeding range and population: from southern Maine to Maritime Canada in the east; there is also a midwestern population that lives in freshwater marshes and wet fields in the upper midwest and the plains of Canada. Our bird was, unsurprisingly, one of the eastern subspecies. Little is known about their migratory movements, so every data point like this is valuable, even if Bryant Park isn't a typical example of their habitat preferences. This photo was snapped by birder Nancy Hager on the tour. Initially, the bird was discovered by my friend Corey Finger, of the 10,000 Birds blog. He spotted it in the morning, as it skulked around in a patch of ivy and under a trash can. Corey was kind enough to call and alert me of its presence; I made it there within an hour but the sparrow was nowhere to be found. 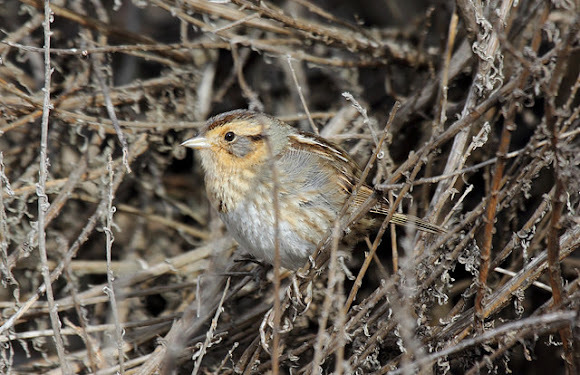 However, a number of other hopeful birders were on the scene, having gotten word of the unusual sighting. Even with all of the people searching, the bird went undetected for the remainder of the day, until the Bryant Park Bird Walk was under way. We had an exceptionally large group of people (about 35), and most of them were treated to at least a glimpse of the sparrow. I wasn't holding out much hope that we would find it, but I did mentioned the noteworthy sighting from that morning. 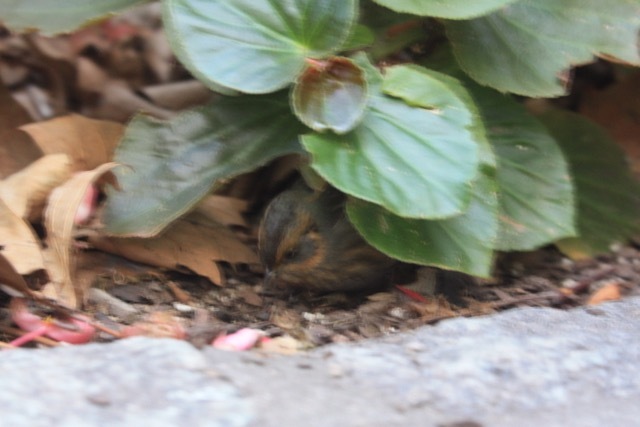 Then as the walk was nearly over, I spotted a small streaky sparrow behind the restrooms; it quickly dived for cover in a patch of begonias. I didn't even entertain the idea that this was the sought-after sparrow, but I got my binoculars on it and much to my surprise, it was! It hopped around between the begonias, giving brief glimpses of its orange face, and the blurred streaking on its flanks, before flying off to a different flower bed. And that was the last that was seen of it; it's probably somewhere south of here by now, hopefully back in a marsh, enjoying warmer climes and tasty seeds and bugs. Who knows what the remaining three walks will bring? Join us to find out!